Q&A with R&A - What is Asset Allocation and how does it lower my tax bill? 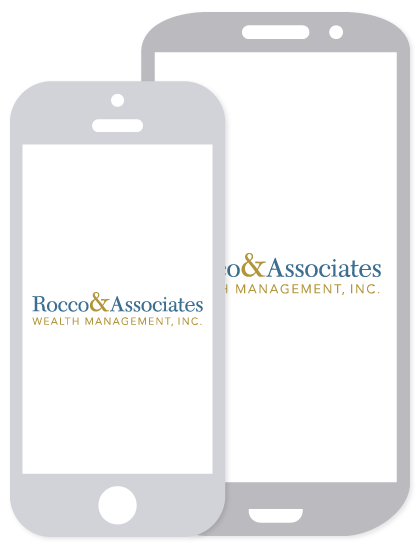 In this month’s Q&A with R&A I am going to talk about a tax strategy that we have been utilizing a lot recently at Rocco & Associates. Asset Location is the process of balancing a portfolio across an investor’s accounts to help maximize after tax returns. We have been implementing asset location strategies across all our clients, designed to generate increase returns by making portfolios more tax efficient. Copyright Michael Kitces 2017 - This chart is for general infomation only and not intended to provide specific advice or recomendations for any individual. All indices are unmanaged and may not be invested into directly. First, the basics. There are essentially two types of tax treatments on an investment account. Most retirement accounts are considered “qualified accounts” meaning that you contribute to the account in pretax dollars and every dollar you take out of the account is taxed as ordinary income. There is no ongoing requirement to pay taxes if you do not take money out of the account. Alternatively, non-retirement accounts, like individual or joint accounts, are considered “non-qualified” meaning that you contribute to the account in after tax dollars and owe capital gains tax on any money you earn above what you invested once you sell the investments. However, in non-qualified accounts you must also pay tax every year on dividend payments, bond interest, and mutual fund capital gains distributions. It is important to note that the highest ordinary income tax rate is 39.5% and the highest capital gains tax rate is just 20%, which is almost a 50% savings! These two types of tax treatments create an opportunity to maximize after tax returns by putting more tax efficient investments in non-qualified accounts so you only owe capital gains tax, and putting the less tax efficient investments in qualified accounts because you will owe ordinary income on those investment gains either way. Tax efficiency of an investment is determined by a number of factors, but it essentially boils down to how much tax you have to pay on the investment every year. For example growth stocks tend to be very tax efficient, because they pay little or no dividends and an investor earns returns on the stock by allowing them to appreciate, or grow, overtime. Conversely, a bond is not as tax efficient, because a bond pays semi-annual interest, which is taxed as ordinary income. In this example owning a bond in a qualified account and a stock in a non-qualified account would increase your after tax returns because you owe ordinary income tax on the bond regardless of which account it is held in, and you would owe capital gains, not ordinary income tax, on the stock when you sold it. Potentially saving 50% on your tax bill! The previous example was a simple one, but determining what is tax efficient becomes increasingly more complicated when you factor in other asset classes, like real estate or commodities, and other investment vehicles like mutual funds. Also, there are behavioral finance concerns. Some clients view all their investments collectively, but others can be upset if one account underperforms another. In families where asset location has been deployed, returns across accounts may vary. 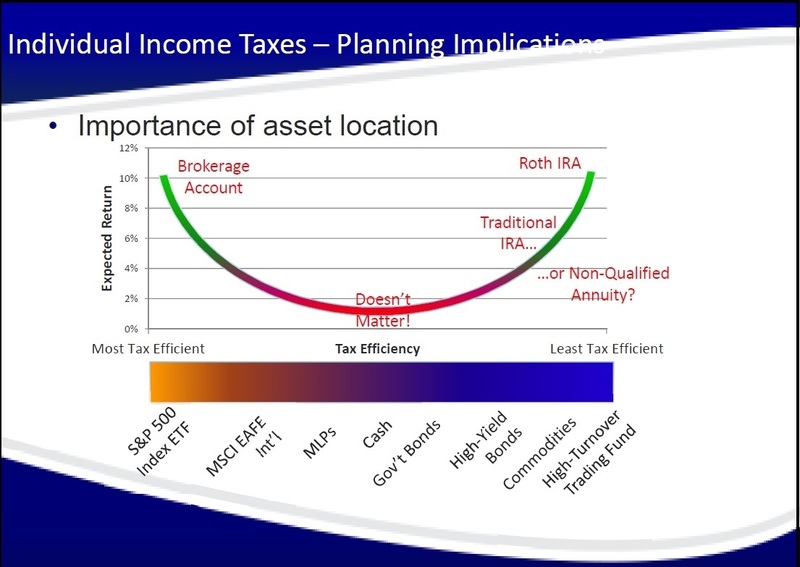 If you use an asset location strategy it is important to remember that your after tax performance for all your accounts combined should actually be higher than owning all the same investments across your accounts, but you will see more variability in returns between your accounts than when each account is invested in the same things. Asset location is a challenge to understand, but tax efficiency is a powerful tool in financial planning. By lowering the amount you pay in taxes you can increase your performance regardless of how the stock or bond markets actually perform. As financial planners we try to live by the motto “control what you can control” because there is so much variability in our business. If you are interested in hearing more about asset location, and if it can help your after tax returns, don’t hesitate to reach out! The opinions voiced in this material are for general information only and are not intended to provide specific advice or recommendations for any individual. Investing involves risk, including the risk of loss. No strategy assures a profit or protects against loss. This information is not intended to be a substitute for specific individualized tax or legal advice. We suggest that you discuss your specific situation with a qualified tax or legal advisor.